Gil Kane has drawn countless comics series for Marvel, DC, and many other publishers over the last 30-plus years. He has always brought to his work a distinctive personality, an intelligence that gives his work a consistent quality above and beyond his amazingly skillful command of the craft. When we learned that Kane was taking over the penciling of the Micronauts, we knew that he would approach this strip with the same kind of thoughtfulness that characterized his stints on such books like Captain Marvel, Captain Action, and Green Lantern in the past. With this in mind, we visited Kane at his Westport, Ct. residence, accompanied by a tape recorder and a slew of questions. We first asked Kane what he thought of the concept of the book as a whole- - the basic premise that holds it together- and what he thought his own particular charms were. "I thought the concept of Micronauts was really a first rate idea by Mantlo. The thing that was good about it was the scope, and the fact that he managed to organize a structure for all these characters. I think the whole idea of a family of interrelationships in the book is what people are looking for. Of course this is a broad statement, but I think that's what does well with Elfquest and the X-Men and the Teen Titans: a lot of characters, each one of them sort of archetypal in his personality." Next, we asked Kane whether he thought Micronauts was a difficult book to draw. "It's the hardest goddamn book I ever drew. All I did for the first week was simply keep shuffling through the material to find the characters - because I was completely new to the material and just found myself thumbing through the stuff, looking for characters, backgrounds. It's a very hard book to do. Then there is the fact that four or five or six of these characters can be at play in a single panel, for just pages on end. And then, in order to meet a threat that's equal to the group, they meet a larger group. Invariably you're going crazy constantly trying to organize interesting patterns in crowds and in fight scenes and so on. There's so much going on in there all of the time-it looks as though someone simply pulled a pin on a grenade and threw in onto the page. There is chaos on every page and you have to organize the chaos. I must admit, I was very impressed by the work Michael Golden did on it, and Pat Broderick too. It's a hard book to do. It's the kind of book that nay artist assigned to it, I think, would ordinarily find his hands full for an entire month." We asked Kane if he was going to be creatively involved beyond drawing from someone else's finished plot, as he has been with many of the projects he has been involved with. "Originally, Jim (Shooter) alluded to me that I would be involved in that, but at this point no one's come to me or asked me to participate and I simply get scripts where the narrative line is completely worked out and I have to interpret it. But at this point, like any artist, given an inch, I'm imposing my own point of view on the material. I have to. And so my own feelings for movement, for action, and for interpreting the characters is different from Broderick's, as Broderick's was different from Golden's - and for that matter different from Chaykin's. The truth of the matter is that each inker who is imposed on a penciler tends to adjust the material to suit himself as well so while you adhere to certain standards and conventions in terms of the look of the material, there are very subtle distinctions between the handling of each artist and the handling of each inker over the artist." Next, we asked Kane about the difficulties in working in the visual characterization, when so many of the characters in the book rarely display their faces. " You have to do it all with their physical postures, the way they stand, the way they gesture, how they respond to danger. For instance, I think that Golden has come a long way in his handling of the material. He's still doing some of the covers now and judging by the way he's handling them to how he handled them when he first started out, he's had a number of thoughts about the characters and adjusted all of them. I agree with most of his adjustments. Mostly his drawing has gotten stronger and better and surer, so he's developed a more deliberate attitude toward the way he wants the characters to look. And because he now has the capacity to draw them as he wants them to appear, he can make them look exactly the way he wants them to look. I try to approach it the same way. The only thing now is, I'm still a little ambivalent about the characters. I haven't developed my attitudes about them-but I expect my attitudes will develop sooner or later if I stay on the book." When Kane works on a strip, he frequently redesigns and reinterprets characters; we asked him whether he might be doing the same with the Micronauts as he worked on the strip. "Oh sure. After all, the characters are based on a series of toys, and believe me; none of the characters are identical to the toys. The toys have only the barest kind of similarity and what the artist makes is an interpretation. Some of these interpretations go against the grain and really bother me. One of the things that really bother me is the ball around the elbow that several of the characters have. It's located right at the point of the elbow, and I don't understand how they flex their arm because of that goddamn ball, it's not a design that I would have used. But I thought most of the material is very successfully designed. As a matter of fact, they've been improving it from the time they started it. For example, the Bug character is infinitely improved; his whole structure has a certain authority that it didn't have before. One of the characters I'm having trouble with, because there's no consistency, is the Devil character. He started off being a duplicate of the Beast, but from issue to issue he seemed to be different. A lot of the artists were having trouble drawing hind legs on him, so as a result the character seemed out of balance. Also he seemed terribly benign for a guy called The Devil. Also, he would somewhere between ten feet high to six feet high, and he kept vacillating all the time. So I'm trying to fix his look. I'm trying to make him more menacing, more heavy in the shoulders and in the chest, and making him more acrobatic and physically capable than he seemed to be. I saw a picture Golden did of him on a cover and I thought the character was beautifully characterized there, and was completely different than what anyone had done with him to that point, and as a matter of fact it totally coincided with what I intended to do with the character myself. I think the strongest characters are the villains, and I think they are very well developed. They seem to have a sort of historical background, and a whole environment in which they grew up and had the time in which to develop their personalities and animosities, and I think that makes some kind of sense." Kane's discussion of the concepts behind the Micronauts reminded us of the controversy over whether the Micronauts' adventures should take place on Earth or in the Microverse - a controversy that has apparently not yet been settled among the creators of the strip themselves. "I myself wish the strip were back in the Microverse, because it's the logical thing to do. To me the real value of the Micronauts is the Microverse, which created their characterization, created the entire context for the material, and is obviously the place for them to get back to. Taking the Micronauts to Earth is like all of a sudden taking all of the characters from Star Wars and bringing them into Brooklyn. You could do it, but what the hell is the point? I just finished a story dealing with their being stuck in a sewer in New York City. I can see a certain value just in the contrast, their being down in the sewer and going through the drain pipes and sewer line, they fight rats…you might be able to get a couple of interesting pictures, but those are obvious pictures and there's no story behind the picture." "But when they're In the Microverse they're able to deal with relationships, because that's where they're all rooted. As a result there are natural problems arising out of the situation that we are not getting out of them coming to the city. To me, having them come to the city just has shock value and nothing else. I think the only way for the material to succeed is to be true to itself and be true to Mantlo's conception, unless somebody else comes in-but I don't think anyone else has the interest in the material Mantlo has. Mantlo is the watchdog of the material and I think he has to be true to his own instincts about it, otherwise they're going to be a pastiche, which ultimately will exhaust all the attempts to hype it up." How did the Micronauts come to be? 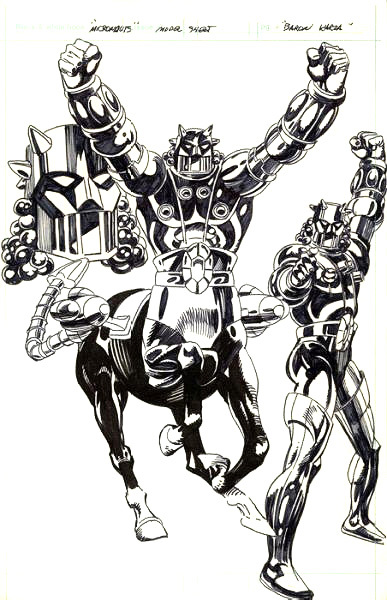 Unlike most such merchandising comic books, which are the product of business deals, Micronauts came straight from the creator of the book: Bill Mantlo. "My son had just reduced a mountain of X-Mas presents to disposable rubble," Mantlo wrote in an issue of Comics Journal a few months before the issue came out, "and sat, in the midst of this mess of paper, tearing a group of tiny shiny figurines out of their vacuum sealed packages. The figures seemed to catch the sparkle of the lights from my parents' Christmas tree. They were unlike any toys I had ever seen - and I've run the gamut in my time, from Dodge City to G.I. Joe to the Shogun Warriors. I asked Adam (that's my son's name) if I could see them before they went the way of all plastic and, when he handed them to me, I held in my palm the four basic figures of a new concept in toys called…The Micronauts." Standing there that Christmas morning, Mantlo began to fantasize, to make up the foundation for what would soon become one of Marvel's most popular series. "I envisioned them as small, microscopic even", Mantlo remembered, "inhabiting an other-verse apart from, but conjunctive with ours." Not only did Mantlo create the basic concept for the comic, but he began to consider the possibilities for characterization the characters possessed. "Space Glider seemed to suggest a Reed Richards nobility, an aspect of command, of dignity. Acroyear, faceless, his armor gleaming, a fantastic sword clenched in his coldly metallic hand, seemed to hearken back to a warrior Mr. Spock. For some reason Galactic Warrior seemed insect-like - I can almost hear clicks and whistles and strange scraping interjected into his speech. But Time Traveler…there was a mystery there, glimmerings of cosmic vastness, intimations of knowledge and space and time all having been broken down and reassembled to produce something entirely new… unexplainable…different." If this were you or I, we would just sit and indulge our fantasies for half an hour, perhaps, and then go on to our jobs. But Bill Mantlo's job consists in indulging his fantasies, and he knew he was onto something good. The following week, he walked into Marvel Editor-in-Chief Jim shooter's office and told him of his idea; Shooter, interested, got in touch with the manufacturer, Mego. "A month later," Mantlo went on, "we had preliminary photographs of the entire Micronauts line. I was, to say the least, floored. I had already begun extrapolating, based on just the four original figurines, a whole series of concepts. Now here, in front of me, were literally hundreds of additional figures, thousands of new suggested concepts…in effect, a whole world in need of a rationale for being." And thus, a Christmas present resulted in the creation of a whole fictional world- in a comic book that has now accumulated an impressive run of 40 issues and was, because of it's popularity, selected as one of three titles to be sold exclusively on the direct-sales market. Maybe Adam Mantlo deserves a co-creator credit on the book. After all, it was his toys that started it all.